Campus Pascasarjana University of Muhammadiyah Sumatera Utara (UMSU). Jl.Denai No.217. Medan, Indonesia. Kode Pos: 20226. Telp. 085358033907. 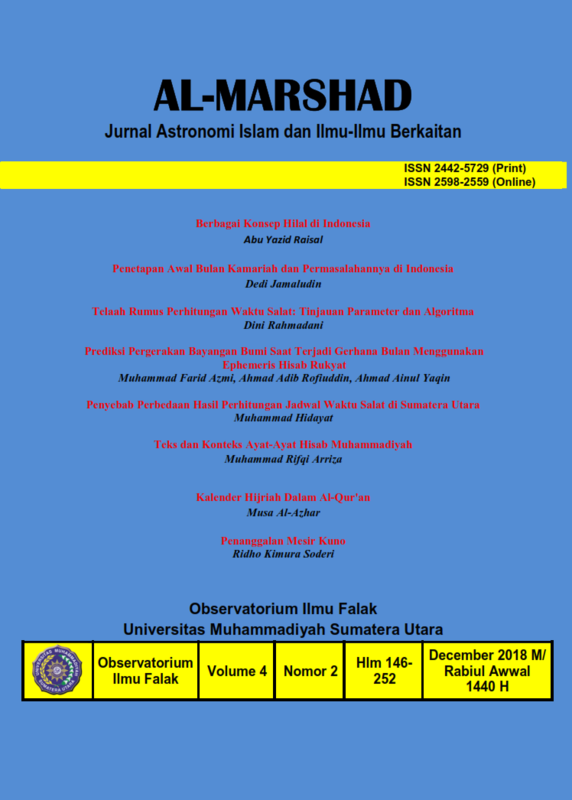 Al-Marshad: Jurnal Astronomi Islam dan Ilmu-Ilmu Berkaitan, published by the Observatorium Ilmu Falak, University of Muhammadiyah Sumatera Utara (UMSU), Medan, Indonesia, which includes articles on the scientific research field of Islamic astronomy observatory and others. Al-Marshad: Jurnal Astronomi Islam dan Ilmu-Ilmu Berkaitan accepts manuscripts in the field of research includes scientific fields relevant to: Islamic astronomy observatory and others. Al-Marshad: Jurnal Astronomi Islam dan Ilmu-Ilmu Berkaitan published Twice a year in June and December. Al-Marshad: Jurnal Astronomi Islam dan Ilmu-Ilmu Berkaitan is licensed under a Creative Commons Attribution-ShareAlike 4.0 International License.